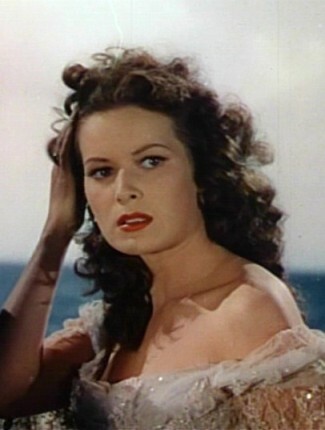 Born Maureen FitzSimons in Dublin, the young actress adopted the name O'Hara, an ancient Irish last name historically found in Sligo and Antrim. Irish last names reflect the long history of the island of Ireland, from the days of the Celtic High Kings through successive invaders to modern times. They did not become hereditary, however, until the 11th century. Up to this time, and for much of the Celtic era, surnames (for want of a better term) lasted just one or two generations. The prefix 'mac', meaning 'son of', was used. So Kieran mac Fiachra was Kieran the son of Fiachra, and his son might be Darragh mac Kieran ie Darragh the son of Kieran. Alternatively, the prefix 'O' (or the older form 'Ua') was used to mean 'grandson of' or 'descended from'. So Kieran O'Conor was the grandson or descendent of Conor. 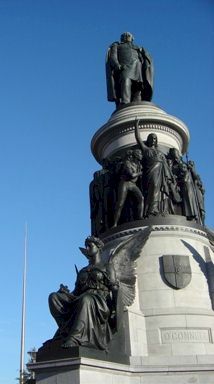 While Oisín O'Laoghaire was a descendent of Laoghaire. This echoing of the first name can still be heard today in many of the most instantly recognisable Irish last names, with or without Mac or O' prefixes, such as Connor/O'Connor, Cormack/MacCormack, Dermot/MacDermot, Leary/O'Leary. This arrangement was considered entirely satisfactory until around the time the great Brian Boru became High King. When he was killed in 1014, he was known only as Brian. He is afforded a surname by history only. By this time, however, many families had started to adopt hereditary surnames of the type we understand today. So, when Brian Boru's grandson, Teigue, adopted Ua Briain to identify his descent from his heroic grandfather, he passed on the tag to his children and their descendents. Today, O'Brien is one of the top 10 most numerous surnames in Ireland. Most of the families that followed this early practice were at the top end of the social ladder (those on the bottom rungs had no real need of them until the 16th century). Following the Norman invasion of 1169, a large number of Anglo-French first and last names entered into the mix. Many, such as Burke, Costello, Nagle, Nugent, Power, Roche and Walsh, are nowadays considered as exclusively Irish. So, too, those with the Fitz prefix such as Fitzmaurice, Fitzgerald, or Fitzgibbon which most people would regard as Irish as shamrock. But it was actually the Anglo-Normans who brought these to Ireland. Burke came from de Burgh, Roche from de Roiste, Power from de Paor, while Fitz can be considered the continental version of Mac since it derives from the Latin/French fils de , meaning 'son of'. In time, most Norman names evolved into an Irish form. These were then anglicised in the 17th and 18th centuries into the versions we now recognise. Original Irish names suffered the same fate. Other introductions from this period came from the mercenary soldiers who accompanied the Norman invasion: Walsh (meaning, and pronounced, Welsh), Joyce and Flemming (from Flemish mercenaries) are examples, and many of the trades of the early medieval period such as Archer, Butler, Carpenter, Draper, Skinner, Tanner and Woodman. Until the 1500s, Gaelic Ireland, with its culture and surnames, continued pretty much undisturbed outside the region around Dublin known as the Pale and a few major ports. But the influence of English was beginning to be felt. Within a century, religious persecution, military aggression and a new wave of invaders had had a dramatic effect on the island. The Plantation of Ulster by Scots and others, the suppression of Catholicism and the Irish language, and the 'anglicisation' of Irish last names (and first names), drove a wedge between the Protestant incomers and the existing inhabitants. As a result, this wave of newcomers did not assimilate themselves into society in the way the Normans had done 500 years earlier. Rather than translate their own surnames into Irish, they slowly but surely forced the Irish to translate their names into English. This is where a lot of confusion about the origin of Irish last names deepens. The name Smith is a perfect example. It was already the commonest in England, so many of the new Protestant settlers that arrived in Ireland in this period were Smiths. Many Smiths from Ireland therefore imagine that they must be descended from English or Scottish Smiths. But this isn't necessarily the case. The word for a blacksmith in Irish was gabhann and the occupation had long ago found its way into a common Irish last name as Mac Gabhann. A large indigenous group of Mac Gabhanns was based in Co Cavan; whether by choice or threat, their name was translated to Smith and stayed that way. Outside of Co Cavan, however, many Mac Gabhanns didn't adopt the translation. They anglicised the spelling, instead, becoming Mac/McGowans. Since 1850, many Irish last names have reasserted their familial identity by resuming the O' and Mac. O'Sullivan is a good example. In the middle of the 19th century, less than 2% of these families used the O'. By 1890, the proportion had risen to 14%. In 1914, the figure was still relatively low at just 21%. By 1944, it had jumpled to 60%, and at the beginning of the 2000s it had reached more than 80%. Many similar translations occurred, and so did many mis-translations. Among the latter was the surname King being given for names such as Conry, MacAree and MacKeary that appeared to derive from the word Ri (king in Irish); it was not understood that these names evolved from families inhabiting the shores of Lough Ree in Ireland's Midland region. Similarly, O'Caoilte/Kielty was translated as Woods because, to the English settlers untuned ears, it sounded like coilte, the Irish word for woods. For many, though, the greatest casualities of this period were Mac and O' prefixes which were largely discarded. With the relaxing of laws against Catholics in the first half of the 19th century, a small number of families started to readopt the historical prefix. Daniel O'Connell, the champion of Catholic Emancipation who died in 1847, was probably the instigator and was certainly the most high profile example. Many followed suit. But it wasn't until the Gaelic League began to champion a revival of Irish culture in the 1890s that serious numbers of families rediscovered their Mac and O's. For genealogists, then, it is important to not discount non-prefixed versions of ancestral names in older records. The same is true of spelling variations. Over the course of the last century, many Irish families have eagerly readopted the O'. The Sullivans were particularly enthusiastic (see box in right-hand column) and so were the Connells. In 1990 there were twice as many O'Connells as there had been Connells 100 years earlier. It is bizarre that some names turned their back on the O' permanently. Murphy, the most numerous Irish last name, Connolly, Donnelly, Doyle, Foley, Hogan, Kelly, Kennedy, Nolan, Quinn and Sheridan are rarely seen with an O' and there doesn't appear to be an accepted explanation for this phenomenon. Another peculiarity is that the Mac prefix has not been returned to its rightful place at the same rate as the O'. This is rather camoflagued by the existence of Scottish Mac names, especially in Ulster, which had never dropped the prefix. The reason is unknown, but may be because the name simply looks so different with the Mac attached (the O' is less obtrusive). Having become used to being identified without the prefix, perhaps many of the Bradys, Clancys, Egans et al found that adding Mac rendered their name too unfamiliar. The most numerous Irish last names in 1890. Ten more Irish family names with history and origins. Return to the main Irish names menu page. Note: This page refers to the anglicised Irish last names that are in everyday use today in Ireland and the rest of the world. It is intended to give an overview, primarily for those interested in genealogy and family history research. For more scholarly considerations of the subject, see: William J Smyth's Atlas of Family Names in Ireland and Sean J Murphy's A Survey of Irish Surnames 1992–97. Contrary to popular opinion, different spellings of Irish last names in old records do not necessarily signify a separate family. So John Doolin may be John Doolan. Or Michael Lonergan may be Michael Lonigan. Similarly, Mc is merely an abbreviation of Mac, and individuals would have used both forms as and when it suited them. Do bear this in mind when carrying out genealogy research in Ireland. The early influence of the church is reflected in many Irish last names, particularly those beginning with Gil or Kil, meaning follower or disciple. So Gilmartin means disciple of St Martin while Kilbride means a devotee of St Brigid. The Irish last name O'Clery (Ó Cléirigh), from 'clerk', is thought to be one of the earliest hereditary surnames in Europe. In a survey of North and East Cork families in 1766, only 3% still used the Mac or O' form. These included 63 MacAuliffes, 50 McCarthys, 48 McGraths, 33 McNamees, 27 McDaniels, 22 McDonnells, 8 Maguires, 7 O' or McBrians, 6 O'Callaghans and 3 O'Connors. Smaller numbers were recorded for 23 other Mac and O' surnames. In 1890, 50% of families in the province of Munster used the O' prefix. Alhough most Celtic Irish last names originate from a first name (O'Niell, Macdermott etc), others evolved from occupations, descriptions and nicknames, and, very rarely, from a locality. O'Clery is thought to be the earliest Irish last name. But its origins don't follow a typical ancestral path. They lie in an ancestral occupation of clerk, probably within the church. Other names that fall into this category are McGowan and Smith. The latter is the fifth most numerous of surnames in Ireland and is the anglicised version of the former, which originates from the word 'gabhann' meaning blacksmith. As Ireland's population rose in the early medieval period, so the number of people with the same first and second name grew. It became a common practice to either add a nickname or substitute a nickname for the original. Examples include Kennedy, which originates from cinnéide, meaning 'ugly head', and Doherty, from dochartaigh, meaning destroyer or obstructive. Less than a dozen Irish last names have evolved from specific placenames. This is surprising because in England and France, Ireland's nearest neighbours, surnames derived from placenames are extremely common. The explanation probably lies in Celtic society being more concerned about a person's family connections than where they came from. My own surname – Santry – falls into this group, coming from the village/river and now northern suburb of Dublin called Santry. But in the first half of the 19th century, all 38 Santry/Sauntry heads of household were found in southwest Co Cork. Similarly, the Irish last name Athy, which originates from the town in Kildare, was found only in Galway, Mayo and Sligo. Clearly then, the family history of people called Ardagh, Bray, Finglas, Galbally, Rath, Slane and Trim many not be centred on those places.